Dr Sue Emmett has been extensively involved in early childhood education and the translation of research into the practical environment for over thirty years. Her professional experience includes early childhood teaching in a range of settings, work as an early childhood educational consultant and teaching and researching within TAFE and Higher Education sectors. 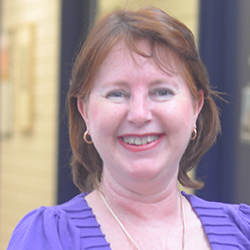 Sue is currently working as Senior Lecturer in Education at FedUni where she coordinates and teaches in Bachelor of Education in Early Childhood Programs and manages partnerships with external organisations both domestics international. Prior to this, Sue worked as a Research Fellow within the School of Social and Policy Research at Charles Darwin University where early childhood literacy was central to her research, particularly in relation to indigenous education. Her research interests also include the well-being of children and educators including trauma informed practice in early childhood contexts. Sue has recently published journal articles, reports and a book chapter in these areas. She completed her PhD in 2011 entitled 'Preparing Professional Caregivers as Young Children's Attachment Partners: A longitudinal study of a new Australian pre-service program' which centred upon relationship focused theory and practice in early childhood contexts as well as learning and teaching at tertiary level. PhD, EdD and Masters in the areas of well-being of children and educators in early childhood settings, trauma informed practice and disadvantage in the early years, literacy develop in the early years, environmental education and sustainability, curriculum development and program design for the early years. Emmett, S. (1991). Snails live in houses too - Environmental education for the early years. Sydney: Martin Educational. (Republished in 1998. Melbourne: RMIT Publications). Emmett, S. (2013). Pedagogies for the Future. Leading Quality Learning and Teaching in Higher Education. In R. a. W. Brandenburg, J. Z. (Ed. ), Pedagogies for the Future: Leading Quality Learning and Teaching in Higher Education (pp. 27-38). The Netherlands: Sense Publishers. Rolfe, S. A., & Emmett, S. (2010). Direct observation. In G. MacNaughton, S. A. Rolfe & Siraj-Blatchford (eds. ), Doing early childhood research. International perspectives on theory and practice (2nd ed.). Melbourne: Centre for Equity and Innovation in Early Childhood. Temple, E. & Emmett, S. (2013). Promoting the emotional and social wellbeing of children in early childhood settings: Investigating the Implications of the Australian Early Years Learning Framework. Australasian Journal of Early Childhood. Harper, H., Helmer, J., Lea, T., Halkitis, K., Emmett, S., & Wolgemuth, J. (2012). ABRACADABRA, Magic under which conditions? Case studies of a web-based literacy intervention in the Northern Territory' Australian Journal of Language and Literacy 35(1): 33-50. Ehrich, J.,Wolgemuth, J. Helmer, J., Oteng, G. & Lea, T. Emmett, S (2010). 'Attendance, performance, and the acquisition of early literacy skills: A comparison of Indigenous and non-Indigenous school children' Australian Journal of Learning Difficulties 14 (2): 131–149. Emmett, S. (2008). The national accelerated literacy program: A solid pathway to literacy success for Indigenous Children. Every Child, 14(3), 34-35. Emmett, S. (1990). Improvised outdoor play experience, Journal of Kindergarten Teachers Association of Victoria. May, 9-10. Emmett, S. (forthcoming 2017). Can early childhood professionals sustain the positive impacts of an attachment-focused pre-service training initiative once employed in child care services? Evaluation and implications. Emmett, S. (2013). The Big Squeeze: Well-being within Early Childhood. Australian Education Union. Adelaide. Australia. Emmett. S. (2014). Well-being in Early Childhood: Myths, Ideals and Realities. Australian Education Union. Melbourne. Australia. Plowright, S. Glowrey, C., Green, M, Fletcher, A., Harrison, D., Plunkett, M., Emmett, S. & Johnson, N. (2016). Re-imagining and Transforming Identity as Rural Researchers and Educators: a (Con)Textual Fugue. Paper to Australian Association of Research in Education. Melbourne, Australia. Emmett, S. (2016). A Double Edged Sword: Articulating from Vocational Education to Teacher Education at University. Paper to Australian Teacher Education Association. Ballarat, Australia. Emmett, S. (2014). Preventing Burnout in Early Childhood Education and Care. Paper to Australian Education Union. Melbourne, Australia. Emmett, S. (2014). Is Your Being Affecting Children's Well-being? The Association of Graduates in Early Childhood Studies. (Panel Member). Melbourne, Australia. Emmett, S. & Temple, E. (2013). Professional Identity, Role Expectations, and Attitudes towards the Promotion of Social and Emotional Wellbeing in Children in ECEC Settings. Paper to Infant and Early Childhood Social and Emotional Well-being Conference. Canberra, Australia. Temple, E. & Emmett, S. (2013). Wellbeing in Early Childhood Education and Care Settings. Paper to Infant and Early Childhood Social and Emotional Well-being Conference. Canberra, Australia. Harper, H., Wolgemuth, J., Helmer, J., Emmett, S., Lea, T. (November, 2011) At first glance. Results of three studies using a web-based technology to improve student literacy in the Northern Territory. Paper to Australian Association of Research in Education. Melbourne, Australia. Emmett, S. (September, 2011). Developing secure attachments between children and early childhood professionals in child-care: A longitudinal study of a new Australian pre-service program. Paper to European Early Childhood Research Association. Geneva, Switzerland. Emmett, S., Wolgemuth, J., Helmer, J., Lea, T. (November, 2010). Improving literacy through computer-based instruction in regional and remote schools. A quasi- experimental study in six schools. Paper to Australian Association of Research in Education. Canberra, Australia. Emmett, S. (July, 2010).A new attachment-focused pre-service education program for professional caregivers of infants: A longitudinal study of its effectiveness. Paper to World Association of Infant Mental Health. Leipzig, Germany. Wolgemuth, J.R., Ehrich, J, Helmer, J, Lea, T, Emmett, S, Abrami, P, & Savage, R. (April, 2010). ABRACADABRA: Using computer based instruction to improve Indigenous early literacy in northern Australia. Paper to Annual Meeting of the American Educational Research Association. Denver, USA. Helmer, J., Bartlett, C., Wolgemuth, J. R, Lea, T, & Emmett, S. (April, 2010). Coaching (and) commitment: Linking ongoing professional development, quality teaching and student outcomes. Paper to Annual Meeting of the American Educational Research Association. Denver, USA. Emmett, S. (December, 2008). Preparing Early Childhood Professionals as Attachment Partners: A Longitudinal study of a new Australian pre-service program. Paper to Laval University. Quebec City, Canada. Emmett, S., & Bartlett, C. (November, 2007). Two literacy projects: A most insightful association. Paper to Australian Association of Research in Education. Perth, Australia. Bartlett, C., & Emmett, S. (November, 2007). A tale of two observation instruments: The evaluation of the national accelerated literacy program, Paper to Australian Association of Research in Education. Perth, Australia. Emmett, S. (2007). The national accelerated literacy program two case studies. Paper to Charles Darwin University Research Symposium. Darwin, Australia. Emmett, S. (2003). Recording and analysing children's learning and development using observational documentation. Paper to Shire of Melton Regional Conference. Melbourne, Australia. Emmett, S. (1993). How green is your early childhood program? Integrating environmental education into the early childhood curriculum, Paper to Kinder Ed Conference. Melbourne, Australia. Emmett, S. (1992). Transformations within the early childhood profession, Paper to Australian Association of Early Childhood Educators. Melbourne, Australia. Emmett, S. (1991). Environmental Education in the Early Years, Paper to Victorian Association for Environmental Education. Victoria, Australia. Emmett, S. (1991). The young child's imaginary world. Paper to Free Kindergarten Association Teacher Seminar Series. Melbourne. Australia. Emmett, S., & Elliott, S. (1991). Environmental education in the early childhood curriculum. Paper to Australian Early Childhood Association Conference. Adelaide, Australia. Emmett, S. (1990). Innovative outdoor learning spaces: planning for young children, Paper to Bundoora and Greensborough Kindergarten Teachers’ Association. Melbourne, Australia. Emmett, S., & Elliott, S. (1990). Environmental education in the early childhood years: strategies for integration into the curriculum. Paper to Australian Association for Environmental Education Conference. Adelaide, Australia. Emmett, S., & Elliott, S. (1988). Early childhood environmental education: an integrated approach, Paper to Victorian Association for Environmental Education. Victoria. Australia. Emmett, S., Fergus, L., Gleeson, C., Kearney, S., Torney, J., Evans, D., Mehana, M., (2016). A Review of Best Practice for Respectful Relationships and Gender-Based Violence Prevention in Early Childhood Settings. Our Watch, Melbourne, Victoria. Wolgemuth, J, Emmett, S. Helmer, J, Bottrell, C, Lea, T, Barlett, C, Harper, H, Abrami, P, & Savage, R (2010). ABRACADABRA! (ABRA) Early Childhood Literacy Project Annual Report No. 2: A Quasi-Experimental Study of the ABRA Literacy Software in Northern Territory Indigenous Classrooms. Charles Darwin University, Darwin, NT. Wolgemuth, J, Helmer, J, Emmett, S, Bottrell, C, Lea, T, Bartlett, C, Harper, H, Abrami, P, & Savage, R (2011). ABRACADABRA! (ABRA) Early Childhood Literacy Project Annual Report No. 3: A Randomised Controlled Trial of the ABRA Literacy Software in Northern Territory Indigenous Classrooms. Charles Darwin University, Darwin, Darwin, NT. Robinson, G., Lea, T., Rivalland, J., Bartlett, C., Tyler, W., Morrison, P., Cooper, J. Emmett, S., Dunn, B. (2009). The National Accelerated Literacy Program in the Northern Territory 2004 to 2008: Implementation and Outcomes. Volume 1: Final evaluation report. Darwin, NT: School for Social and Policy Research, Institute for Advanced Studies, Charles Darwin University, Darwin, NT. Robinson, G., Lea, T., Rivalland, J., Bartlett, C., Tyler, W., Morrison, P., Cooper, J. Emmett, S., Dunn, B. (2009). The National Accelerated Literacy Program in the Northern Territory 2004 to 2008: Implementation and Outcomes. Volume 2: Final evaluation report – Appendices. Darwin, NT: School for Social and Policy Research, Institute for Advanced Studies, Charles Darwin University. 2016 Vice Chancellor (VC) Citation for Outstanding Contribution to Student Learning application for outstanding leadership in the conceptualisation and development of Early Childhood Education curriculum for pre-service teachers through community partnerships and innovative pedagogies.